This weekend sees the return of the National Football Leagues, and on Sunday Galway welcome Kerry, the in-form team in the country right now. Fixed for Tuam Stadium at 2pm, supporters will also have an opportunity to view the progress of the new stand and dressing rooms. Playing with a new-found freedom, Kerry will come to Tuam full of confidence after their win against Dublin. However, Galway teams can never be underestimated in Tuam. The players and management will be keen to build on the Monaghan performance and keep the good feeling flowing through the county after Corofin’s win last weekend. It does mean that Corofin’s players, such as Liam Silke and Ian Burke, will be ruled out, while forward Damien Comer will be out of league action for some time to have surgery for an ankle injury. However manager Kevin Walsh will have been delighted to see Michael Daly having played the full 60 minutes against UCC in the Sigerson Cup on Sunday. He was one of six of the current league squad that played in the universities' competition, while Finnian Ó’Laoi, who has not played since injuring himself before Spiddal’s All-Ireland semi final last month, also featured in that 4-9 to 1-15 Sigerson defeat in Mallow. Kerry's new management and players appear to have pushed them to the next level, and their winning performance over Dublin shows what this new Kerry team is all about. They will, of course, be judged on the championship, but they are certainly on the right track. With Seán Ó’Shea in devastating form, Galway’s set up will need to be on top of their game to deal with his threat. A win on Sunday would all but secure Galway’s position in division one for another year. And with captain Comer quite possibly missing the start of the championship, Walsh will hope there is good news on the injury front. 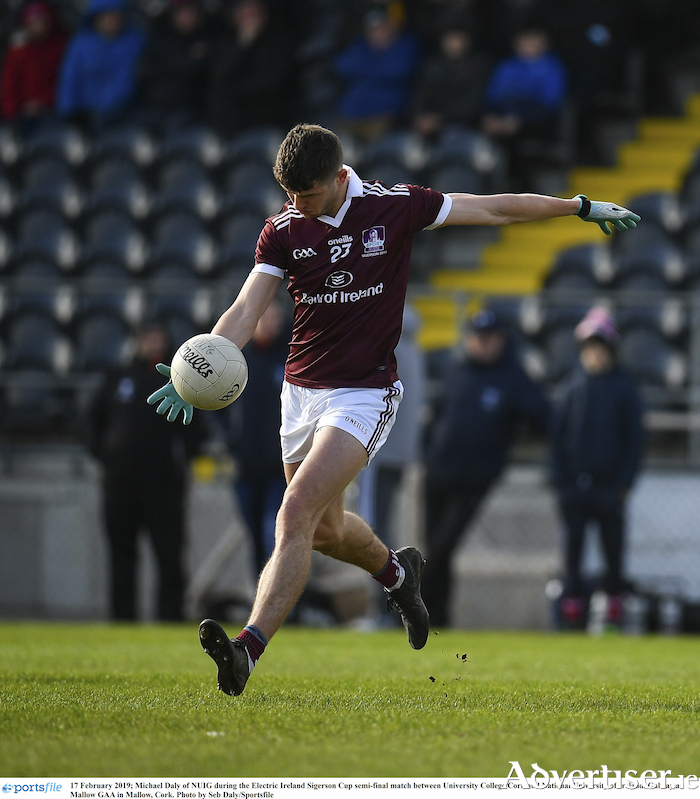 Eamonn Brannigan is nearing full fitness, Seán Andy’s return to training, and Ó’Laoi’s return with NUIG means Galway’s injury list may be beginning to ease off. A crowd will always travel to Tuam and plenty of support is needed this weekend to help overcome the challenge of the mighty Kingdom. Galway will not fear this team, having beaten them in Tralee in last year’s fixture, but Kerry, under Peter Keane’s guidance, is now a different prospect.